So you’re determined to make use of this online social network phenomenon, which is apparently now how jobs are filled, companies are started, the social “A” list determined, and so on. Good. What to do? Well, a main part of it is to make your online activities visible to the right people, in the right way. To think about this, I propose an analogy of a river system. What? Ok, so in general, a person using social networks has some set of activities and communications which she wishes to convey to certain audiences, possibly to the world. But not all of your audiences want to get all of your news. Perhaps this is stating the obvious. But half the people I talk to, if social networks come up, profess total incomprehension, and often dismay, fear, and paranoia. So this is for you. My key, if not earth-shattering, idea, is that various audiences want progressively more filtered versions of your personal newsfeed. But there is probably a core stream, such as your personal or professional blog, that is occasional and newsworthy enough for everyone to tolerate. Think of that core stream as the headwaters of your river — clear, pure wisdom, up in the mountains. Now the river flows along, and other tributaries enter into it, and the river gets wider. This is like your news stream being joined by new data, such as postings about your new photographs, or notices from your book-collecting service about your new acquisitions (I’m cutting back, I promise! ), etc. Well, various audiences downstream are OK with drinking from the bigger river, because well, the river is bigger and they want more of your water. What do you think? 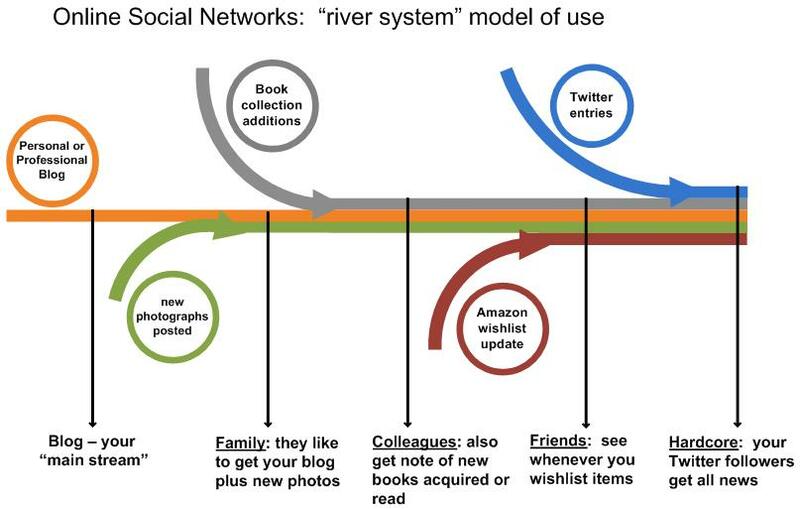 Is your social networking like this, or is everything in one flood, or do you have multiple rivers? Here’s the diagram illustrating the model. Click on the image to see a full-size version. PS: Other vocabulary from the world of watershed planning... tributaries... intermittent streams.